The golf trolley speed control switch is a common spare to go wrong. It is nearly always damaged inadvertently from getting a knock on the speed knob. This damaged the stem of the switch and causes it to loose connection either all the way through the speeds or partially through the speeds of the motor. Note the stem of this damaged switch is leaning this becomes very loose through being knocked or bumped by an object or sometimes when packing away in the boot or similar. Notice the movement in the stem of the switch from side to side. 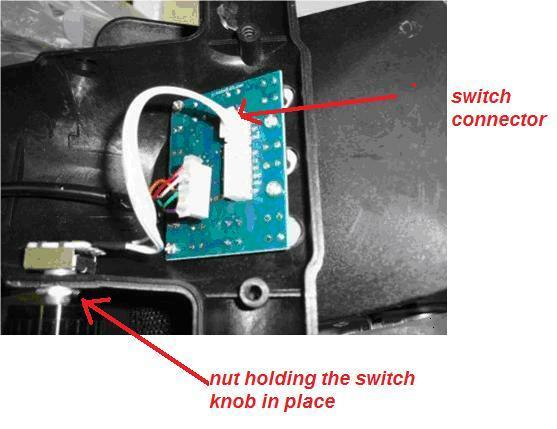 This is usually caused by a blow to the speed switch rotary knob. Sometimes when packing and folding away, it can get accidentally hit. 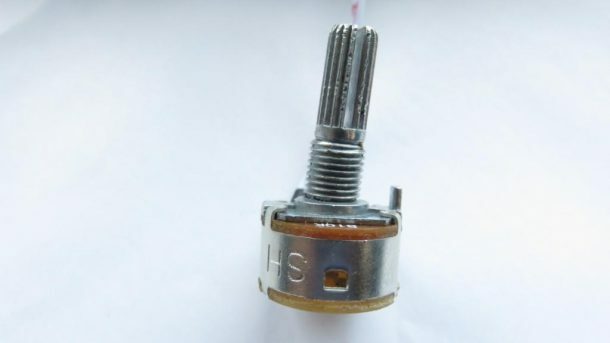 With the speed switch stem then unable to get a uniform connection when turning the knob stem around. 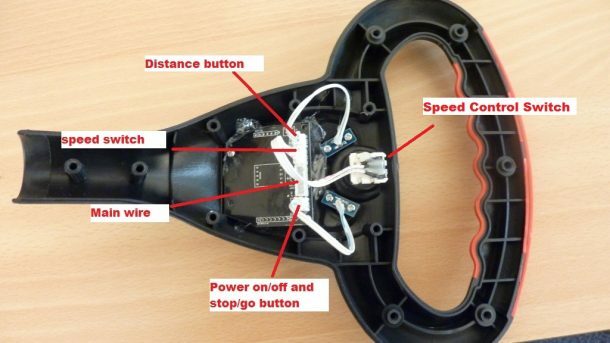 The connection at the potentiometer is interrupted and hence the speed numbers jump from low to high and don’t scroll smoothly through the speeds set by the golf trolley controller. Testing and fixing the speed control switch is fairly easy by way of checking the trolley for erratic speed setting when increasing or decreasing the speed on the switch. See support page for help. Depending on the model of golf trolley you have the determines how easy to replace the control switch is. Fitting a new one is easy and tricky at the same time. Showing the broken to one in place and the new switch shows the the speed on the handle circuit scrolling smoothly and working well again. These models can be replaced by removing the back of the handle unplugging the switch and removing the nut on the outside of the handle by way of a spanner. The round handles golf trolleys with the smaller knob are slightly more difficult as they require either a long socket or point nose pliers to remove the nut. No I don’t believe this is the correct switch for any of the Motocaddy golf trolleys. Hi George Unfortunately we don’t have the hillbilly wires in stock but hope to have shortly. I have replaced my Pro rider electric golf trolley motor, but when I switch ON all it wants to do is go at full speed. Even when I adjust speed control knob it just stays at full speed. Could you please point me in the right direction as to what I may need to replace. If your display LED is lighting up normally then chances are it is likely to be the S1 controller box (under the battery tray) which has malfunctioned and not the handle’s circuit board (PCB). We supply the newer upgraded 9 speed S1 controller which will fit perfectly in place of your original. It has 3 separate / different plug-in connectors, this keeps it simple to replace. I have a 2 year old Stowmatic GXT golf trolley. When I turn the speed control switch there is approx 2 sec delay and then the trolley wants to go at full speed even though the display is . When I try and alter the speed it doesnt react then it will be going at a snails pace or at full speed. I have changed the speed control button but it didnt have any effect. Do you think it is the electronic control board causing the problems? Ahh, This is a difficult one to say without the test bench. I would have though also it was the speed control switch. I have seen it being the handle PCB and also the controller. If the display is working as normal (no corruptions in any way) then I would think the controller is most likely to be causing this irregularity. To be honest it is very difficult to know. Of course you are welcome to send both the golf trolley handle circuit and controller to me and I will put them on the test bench and let you know, only charge is for the cost of the returning them to you, or in with a purchase if you end up buying a spare part. Please email me on admin @ electricgolftrolley.net and I will take you through the procedure to send them for testing. It is always difficult to determine exactly but in many occasions when the trolley jams on / off and at high speed and the speed control switch is working then the S1 controller (located under the battery tray) is faulty and needs replaced. A new controller will simply plug in place of the original. Available in the online store.